My days of late have been filled with natural flavor! In the past couple of weeks I’ve been able to harvest peppers, garlic, and onions. I’ve spent the last few days preparing them for storage. Two jalapeño plants or Capsicum annuum var. jalapeño I’ve grown in the greenhouse throughout the summer each produced a couple dozen peppers which we’ve enjoyed using in salsas and other recipes. I allowed the last peppers to ripen to a rich, sweet red. I chopped these jalapeños then froze them in baggies to use in upcoming months. Some people mistakenly believe jalapeños get hotter the longer they ripen, but I think the opposite is true since the sweetness they develop makes them taste mellower. 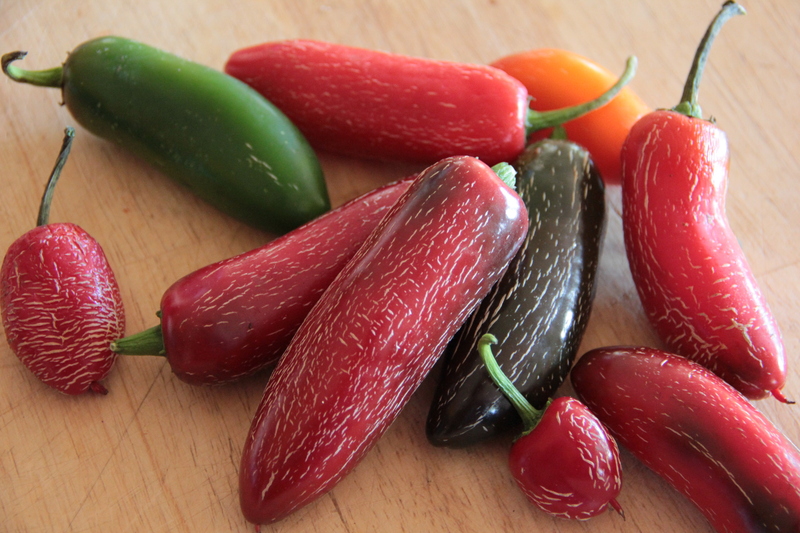 I don’t pick peppers before they fully develop in flavor, showing these white striations, or “corkiness.” Green jalapeños gain the corkiness as well. 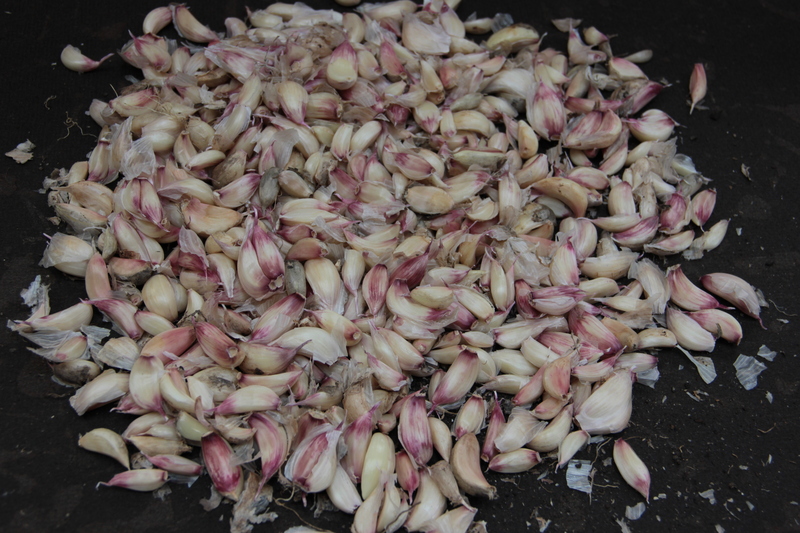 After digging up the dozens of heads of hardneck garlic which were planted and left for us by Coppertop’s previous owners, I allowed them to dry on a counter in the garden shed for close to two weeks, then separated the cloves. I’ve been using these in recipes and have begun to process the rest by chopping, mixing with olive oil, and tucking small batches into the freezer. The point of mixing them with oil is to simplify scooping out portions, as oil doesn’t fully firm up in the freezer. I purchased and planted garlic as well, dividing their cloves and placing them into soil in a raised bed. These will overwinter beneath straw and send green shoots beginning spring. I planted two varieties from a local farm store: German Red and Blanak. 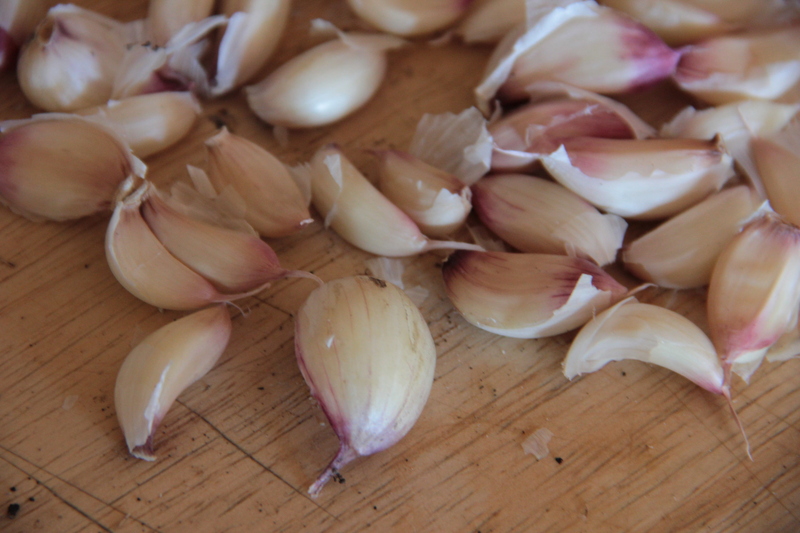 Garlic can be grown from large cloves you harvest yourself, but I wanted to start fresh. 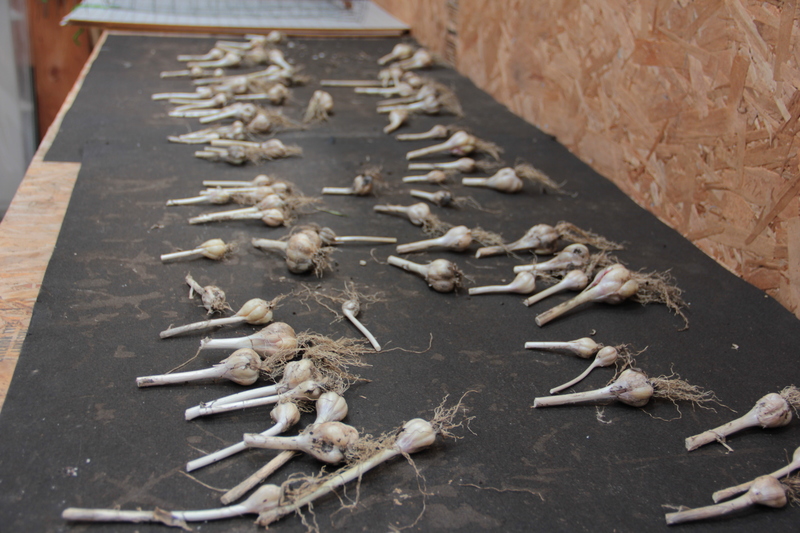 Hardneck garlic grows more reliably than softneck in the Pacific Northwest. It’s one of those plant-it-and-ignore-it crops! 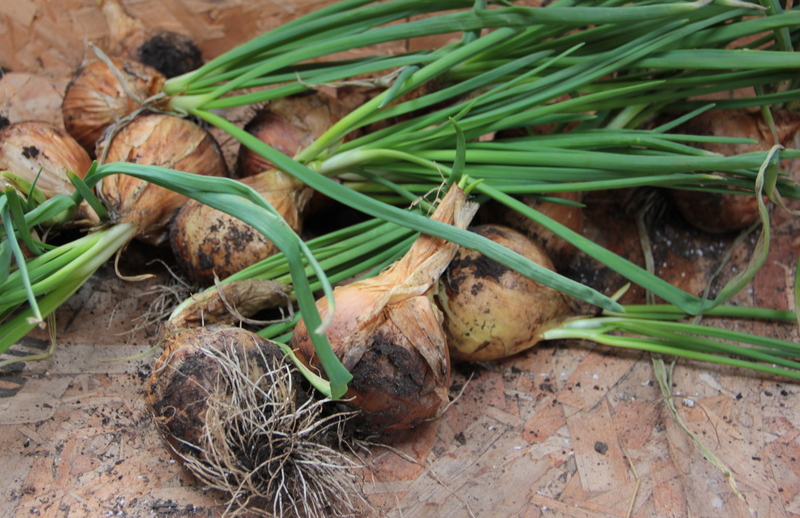 A week ago I decided to harvest about a third of the Walla Walla onions I’ve been growing. I planted these in stages beginning in April as two $2 sets of tiny bulblets, and they have thrived. Since the onions air dried in the garden shed, and their roots dried up, I donned a pair of goggles and spent a good hunk of the weekend chopping some, dicing some, and freezing all in baggies. I’ll use these to cook with throughout the winter and spring. Fresh walla wallas only last about a month in cool, dry storage, so I think it’s best to harvest them in stages. The daunting fact is that my onion bed still has so much remaining to harvest. 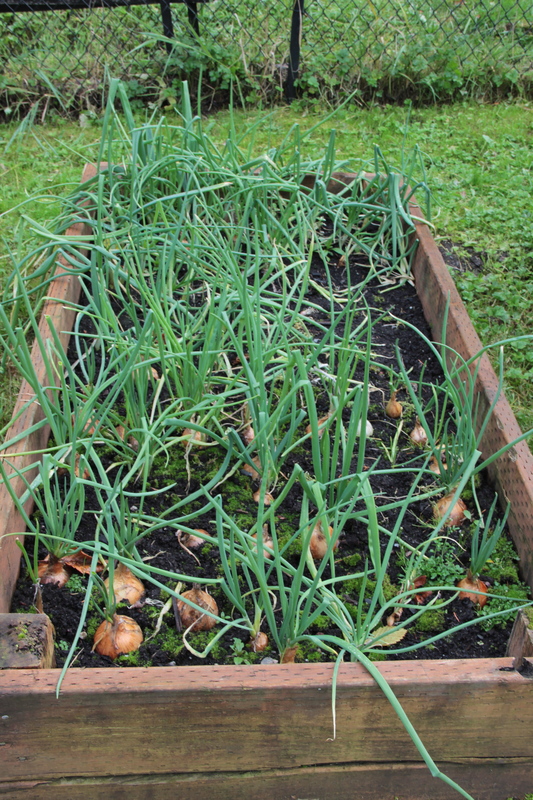 The youngest onions are a mass near the top of the photo and all could use a good weeding. Not bad results for an initial $4 investment. Time to find those goggles again and get to work chopping and freezing. This entry was tagged corking on peppers, gardening, hardneck garlic, jalapeño peppers, Olympic Peninsula, sweet onions, walla walla onions, Western Washington. Bookmark the permalink.